From the Pop Shop America DIY Kit listing. If I’m being totally honest, I selected the craft box from Pop Shop America because one of the samples in the listing was the Sunprint kit. You can’t select what comes in your subscription kits. Instead you get a different surprise every month. However I secretly hoped that maybe I would get the sun print kit at some point. Because -need I explain?- sun prints are so cool! It’s art! It’s science! Botanicals! Beauty! Imagine my glee when I opened this month’s kit to find exactly that. I received this kit for the purpose of this review. The sun print kit comes with special light-sensitive paper. When you place leaves or flowers or whatever you desire over the paper and set it in the sun, the parts of the paper exposed to the sun change colour. (Pop Shop America also includes several items you may use, including those I used in my example below.) This provides the image of whatever item you used in relief on the paper. It’s really a very simple craft. Anyone can do it. Even a toddler. The simplicity of the activity doesn’t take anything away from the beauty of the end result. Simply place the object(s) on the paper and cover with the enclosed plexiglass (unless it’s a three-dimensional object of course.) The plexiglass is especially helpful if you’re working outside on a windy day, I discovered. Wait until the sun turns the blue of the paper to white. Then take the paper inside and rinse with water. Once dry the paper turns a lovely blue and whatever was covered when out in the sunlight is white. It’s like magic! Hello beautiful. Just look at the detail! You’re limited only by your imagination in what you create with these sun prints. Likewise with what you do with the final product. I couldn’t resist making my first print into a notecard. 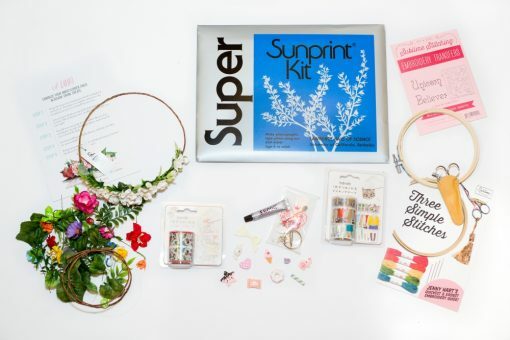 Pop Shop America offers a variety of subscription kits in addition to other modern, handmade items for sale. This is my second box from their DIY Subscription Kit. See the first box here.